With upcoming finals in a little over a week, it can get very stressful to handle all these finals so close together. Finals are always some of the most stressful weeks. 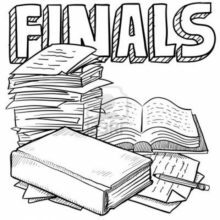 Here are the Top 5 tips that will help you study to pass your finals. Start Studying Now: Don’t wait to the last minute to study for all your finals. You have plenty of finals to study for, take some time out of your day to do so. Cramming is a ineffective way. Set A Study Schedule: Organizing your study time is essential. Set your alarms as a reminder to study. Make to-do lists so you know what you need more time studying. Ask For Help: You will eventually get stuck on something and not know how to do it, so ask for help. If you need help, don’t be afraid to ask for it, or else you won’t be able to solve it on the test either. Khan Academy it up: Khan academy is a helpful tool to help you to study, even if it isn’t your style you should look for other sites and apps. Find something that helps and motivates you to study. Have an accurate site checking your work, so you know how to learn from your mistakes. Take Breaks: Give yourself time to breathe. Get good rest and eat well, so you can study better. Getting frustrated and continuing to study won’t help, just annoy you. Be sure to take a break from time to time.